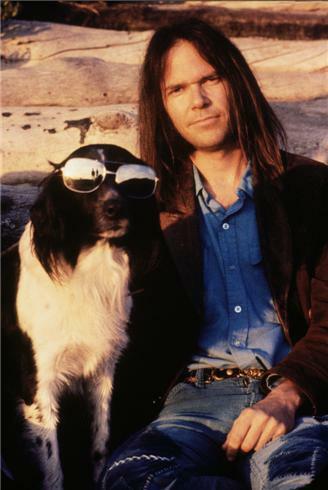 Henry Diltz: Here is Neil Young with his dog Art. This was in Malibu in front of a beach house that Neil had there for a while. This was one of his favorite dogs and Neil had just put the sunglasses on him (in the sunglasses you can see Gary Burden and I standing there taking the picture). Unfortunately, shortly after this the dog was shot by a neighboring rancher for chasing his cattle, which is sort of the unwritten law -- that if a dog chases your livestock, you have the right to shoot it. So although Neil was very upset, he understood. Speaking of dogs, who can ever forget "Old King"? Dogs are proof that God really loves us. I think Neil said in an interview around this time that he called the dog Art so he could say that "Art" is just a dog that sits on my front porch, or something like that. I totally agree, Mr Henry. I'm a Dog lover myself and appreciate Neil for his love of Dog's as well. The sad part is their relatively short life span which pretty much guarantee's that we have to suffer the loss of our beloved pets. Just as Carl passed away not long after the video for 'Johnny Magic' was shot.